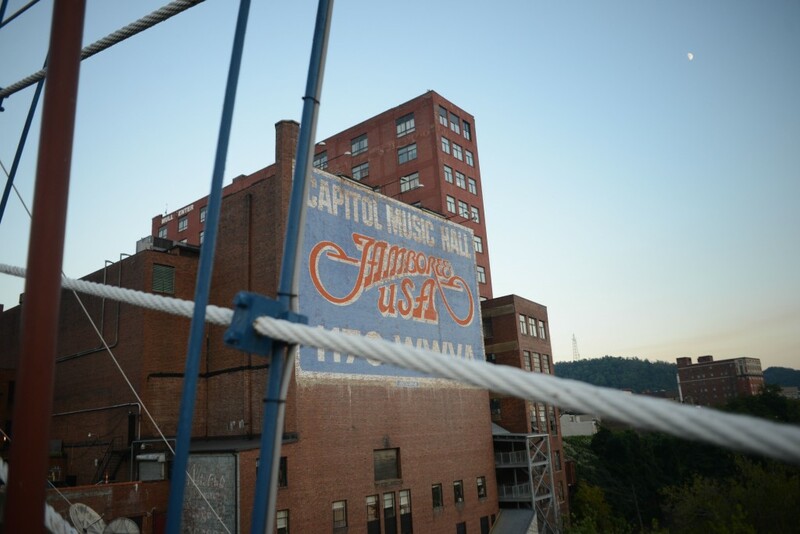 Photo essay: What’s growing in West Virginia’s urban ruins? WHEELING, W.Va. — When Danny Swan first broke ground on his West Virginia farm in June 2008, his rototiller hit a baby doll. Then some porcelain plates. Then a pair of pantyhose. 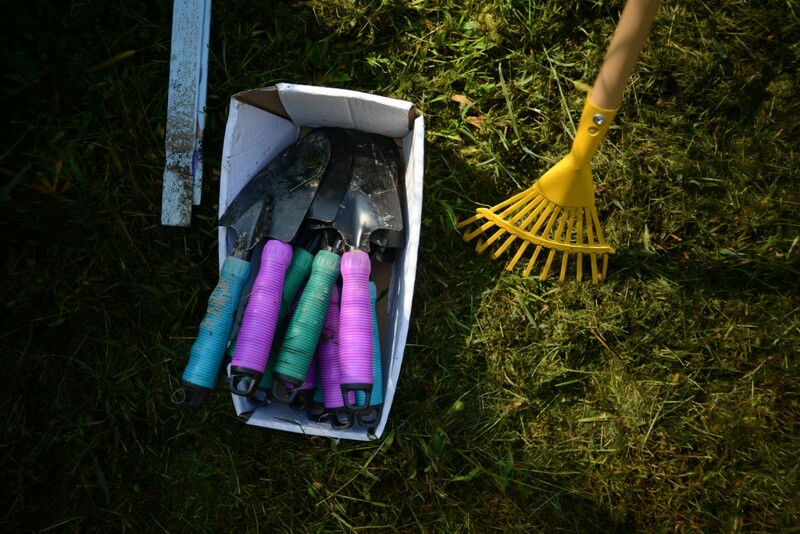 It didn’t take him long to discover that pieces of an entire urban neighborhood were buried beneath the soil — “bricks and rocks and everything else contained in houses that used to be here,” he said. Perhaps just as surprising was Swan’s desire to build a farm in that spot in the first place. 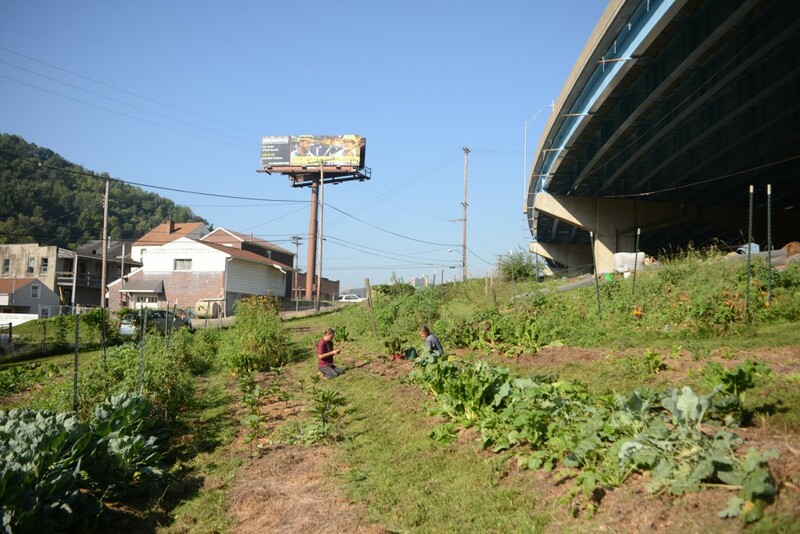 “Farm 18”, as it’s become known, is not only situated on 18th Street in one of the toughest neighborhoods in Wheeling, it also sits directly adjacent to the viaduct, or bridge, of a four-lane highway. Local farmers warned Swan that it would all add up to spectacular failure — that if the neighborhood vandals didn’t kill the plants, the debris-strewn soil would. “And the first couple of years were a little scraggly and rough,” Swan said. But then the opposite happened. 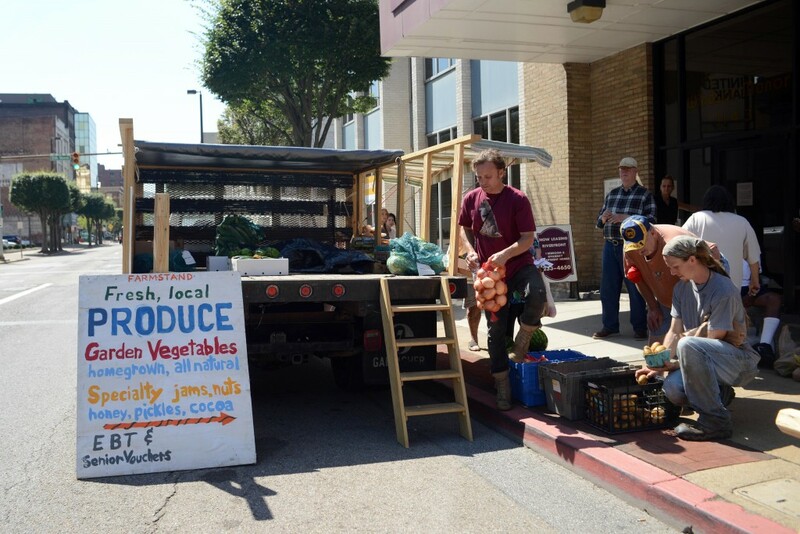 Crop yields grew by the year, along with community participation in the farm. By the end of the season, it’s expected that $20,000 worth of produce will have been pulled from the vines of Farm 18’s one-acre plot. 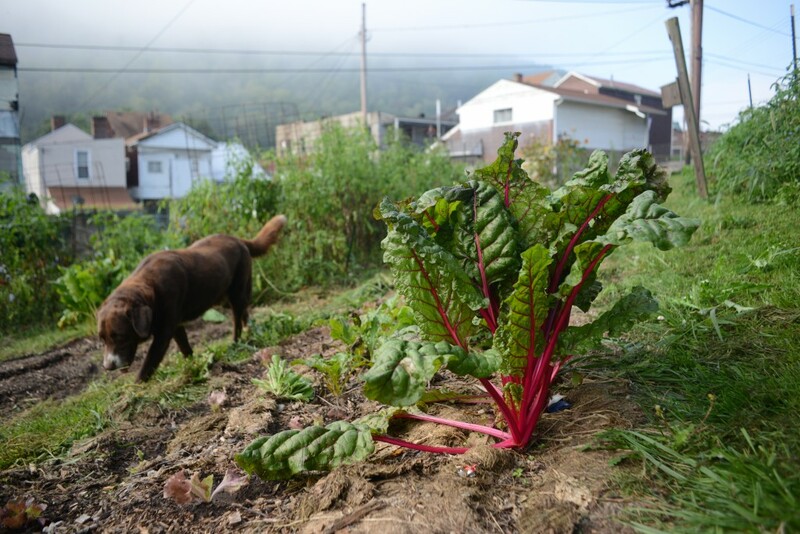 And since 2008, roughly two dozen copycat gardens have popped up throughout this city in West Virginia’s northern panhandle. There’s a new weekly farm stand to sell the produce, and plans are in the works for an organic inner-city teaching farm and orchard. 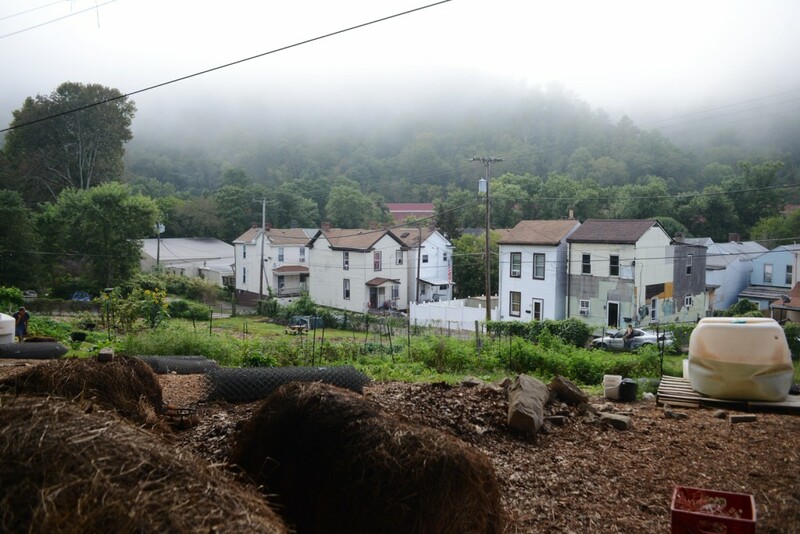 Eventually, people stopped rolling their eyes about the urban farm plot in East Wheeling and began talking about it as the start of a larger economic movement — one that might help reverse the fortunes of their long-suffering hometown and the health of its residents. On many mornings — especially during harvest season — farm manager Jocelyn Carlson has her hands in the dirt as early as 4 a.m., when the city streetlamps are all that’s lighting up the plants. But even after the sun rises, it can be hard to spot Carlson among all of the blackberry bushes, kale, Swiss chard, tomatoes, spinach, carrots, radishes, eggplants and Brussels sprouts — stretching from the fenceline of the row houses on 19th Street, past the chicken coops, straight to the edge of the Route 2 viaduct. Swan usually joins her a little later in the morning — these days, with his newborn strapped to his chest. The land across from the chapel, under the viaduct, looked like as good a spot as any. So Swan and the children wrote to the West Virginia Division of Highways and asked for permission to use it. The 20 tomato plants went in a few weeks later. By the time Swan graduated, neighbors had begun dropping by to get their own hands dirty. A farmer from Ohio brought hay to fertilize the ground. The fire station filled giant tanks of water to irrigate the plants. It looked like there might be a future for this project, and Swan didn’t want it to end simply because he needed a full-time job that would pay the rent. His solution: A wigwam. He always had “a romantic notion” that he could live in one. “And I was a young, single guy, so I figured this was the time,” he said. 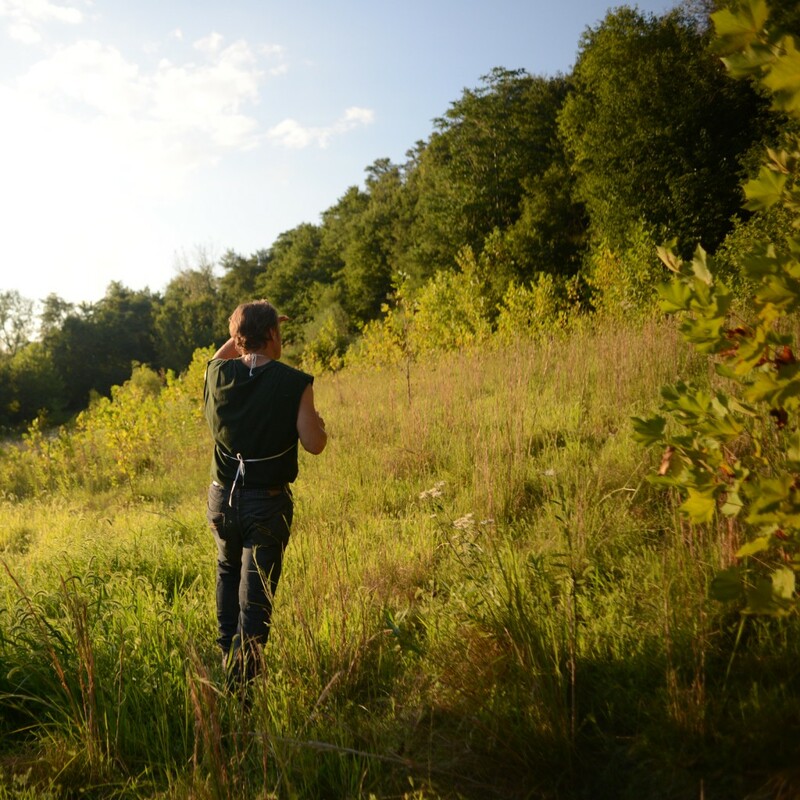 Swan walked to the edge of town, then 45 minutes up a forest-covered hillside, to a spot where he could see much of the Ohio Valley. There, he built his wigwam: a teepee-like structure where he lived rent-free for a year while he launched Farm 18 in force. What Swan saw each morning when he looked out from his wigwam was a city hurting. In its heyday, this valley was a powerful place. A city that forged steel, glass, nails, tiles and pottery. A producer of toys, textiles, cigars, coal-fired power, and a nationally distributed country music radio show, “Jamboree USA.” Millionaires and mobsters thrived here — and for a while, so did the Lebanese, Syrian, German, Irish and Italian immigrants that filled its factories, theaters and night clubs. But as manufacturing shifted overseas and the industrial bases in cities like Detroit, Pittsburgh and Cleveland crumbled, so did Wheeling. Today, most of the factories are silent. The towering department stores on Market and Main streets sit empty. Rotting Victorian homes have been known to sell for $1. From his view on the hillside, it all looked like opportunity to Danny Swan. 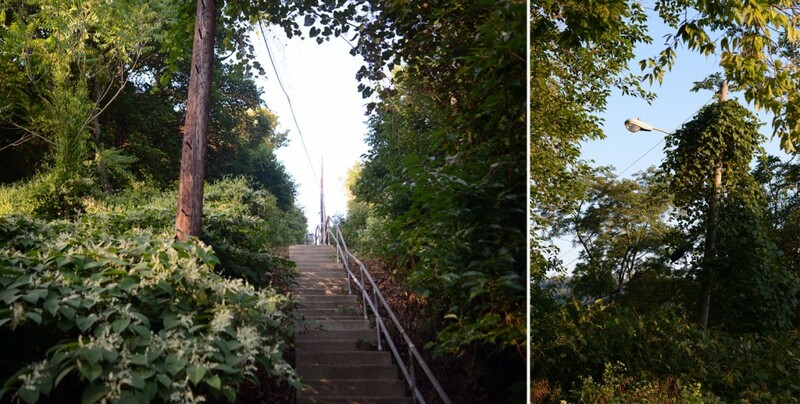 There’s a concrete stairway in East Wheeling that leads from the neighborhood in the valley to a crumbling asphalt road overgrown with weeds on the hillside above. If the weather’s right and the weeds aren’t too high, it’s sometimes possible to follow that road to the post-apocalyptic scene that lies beyond. Telephone poles and rotting lampposts still line the street at regular intervals, along with the occasional fire hydrant. But on this day, Ken Peralta is most interested in the plants. Just over a decade ago, this entire hillside was the home of the Lincoln Homes public housing development — a series of low-rise, low-income apartment buildings that stretched from the stairway to the crest of the hill. 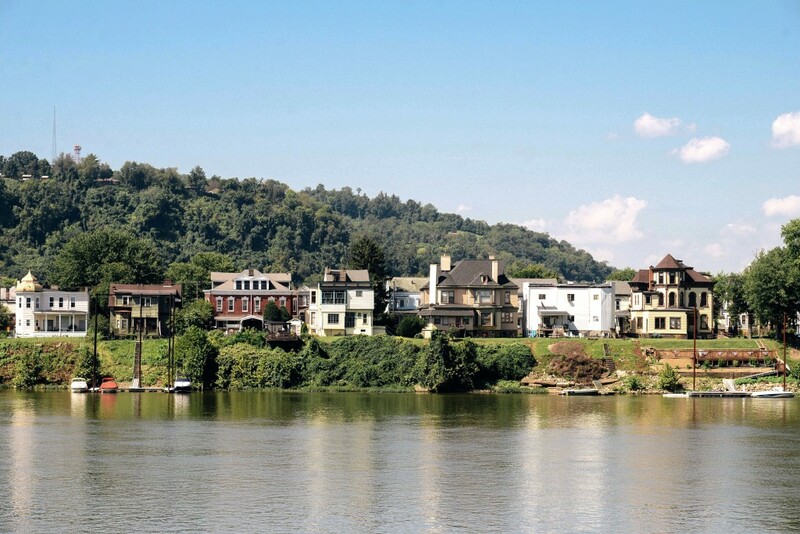 It was a dense, bustling place, central to Wheeling’s black community. But the city had others plans for this neighborhood. The population was “relocated,” the buildings demolished and promises made for new apartment buildings in the same area. The last part never materialized. The Housing Authority determined that the soil conditions “weren’t conducive” to new construction, bringing the entire project to a halt. A park with an agricultural twist. Peralta handles the business side of a new nonprofit he started recently with Swan. It’s called Grow Ohio Valley, and the idea is to do just that: develop this area as an incubator of best-practice urban farming techniques and then teach unemployed locals how to turn Wheeling’s vacant lots into plots of profitable farmland. Farm 18 will be a model. 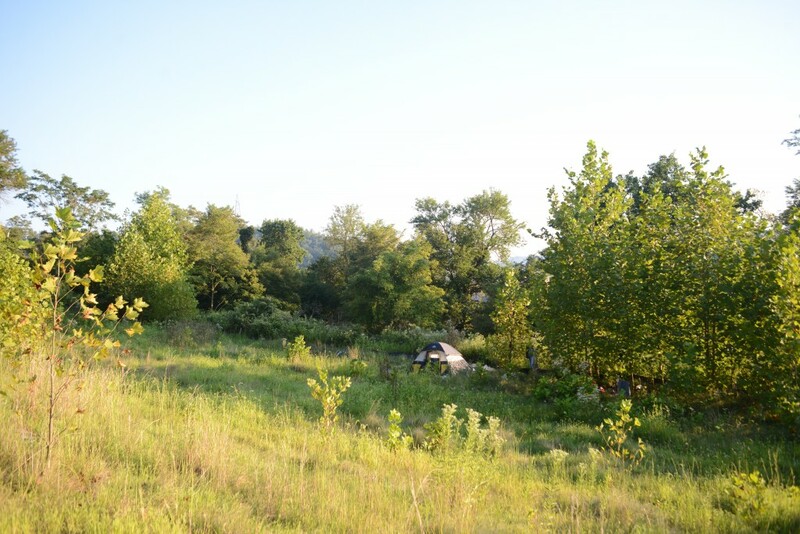 To get to that place, Peralta and Swan are in the final stages of negotiations with the Wheeling Housing Authority to turn the former site of the Lincoln Homes neighborhood into a teaching farm. A flat meadow halfway up the hill will become a tiered field where anyone interested can learn agricultural techniques. The crumbling road will be converted into a walking path lined with signage about indigenous plants and the history of the area. 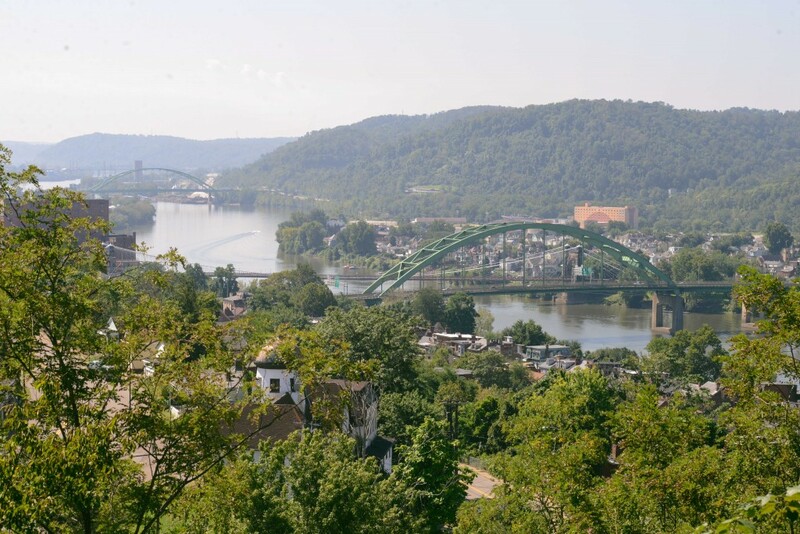 And to top it off — literally — the crest of the hill will be planted with hundreds of apple trees in recognition of Johnny Appleseed’s famous trek through the valley. It’s what’s needed to take this idea of a local urban farming movement to the next level, Peralta said. “Because we don’t want to be a nonprofit farmer. We don’t want to take money and customers away from farmers. We want to help create more farmers and more sales outlets so this area can become something of a ‘food hub’ — a place growing a lot of food and then selling it regionally to the big markets that are just a couple of hours away,” he said. When Peralta first moved here from New York, he conducted a study of the regional food shed funded by the Pittsburgh-based Benedum Foundation. He was curious to find out where local food dollars were going and what the impact might be if a small percentage of those dollars — 10 percent, for example — were to be diverted to locally grown foods. The next step will be convincing Wheeling itself to buy in. 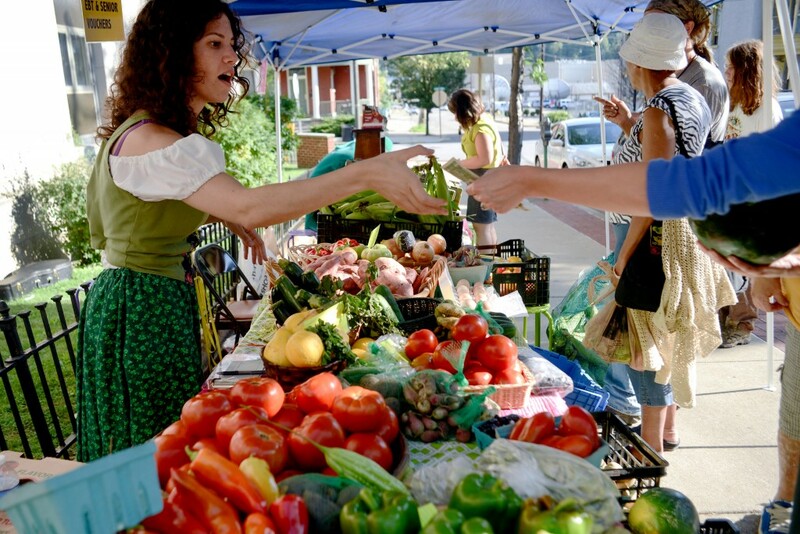 Each Wednesday in the late spring, summer and fall, Grow Ohio Valley sets up shop at a farm stand outside of the massive former headquarters of the Hazel-Atlas Glass Company in East Wheeling. There’s usually not a whole lot happening on this block, so farm stand manager Kate Marshall brings in musicians and sidewalk chalk. She adds to the carnival-like atmosphere by rattling off the latest crop of produce from Farm 18 when customers approach. White-collar professionals make up one of the three tiers of Grow Ohio Valley’s core customer base. They’re the ones most interested in the “organic” and “local” piece of all this. 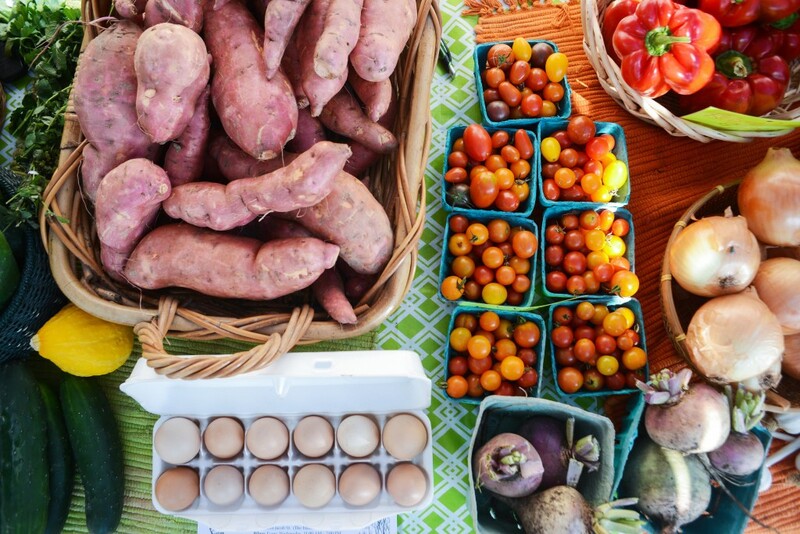 The other two-thirds — the Food Stamp recipients and working-class people who live in this neighborhood — need the farm stand on a much more basic level. 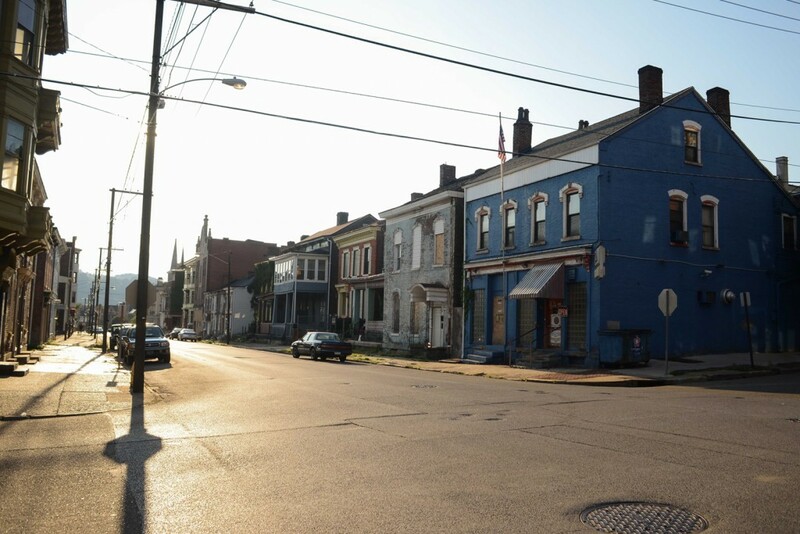 There’s no supermarket in downtown Wheeling, making most of the city a “food desert.” Nearby convenience stores sell a variety of high-calorie, processed foods, but the residents of this neighborhood have been hungry for easier access to fresh produce for years. 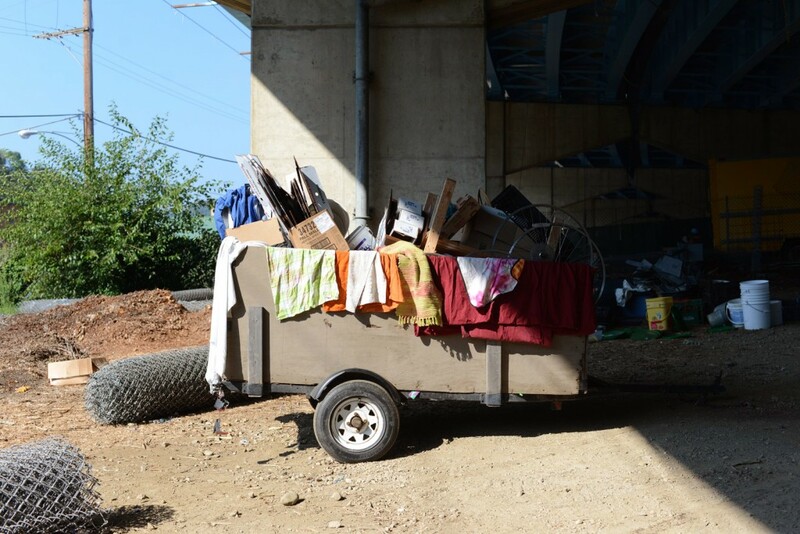 It’s such a novelty that East Wheeling residents like Damon Clark sometimes get flustered with the abundance of options suddenly available on the sidewalk. But even at its busiest, sales at the farm stand certainly aren’t enough to make up 10 percent of the local food economy. Marshall says that will take education, time and outreach. Which is why Grow Ohio Valley is also taking its show on the road. Two days each week, a flatbed truck pulls up to one of the high-rise apartment buildings in downtown Wheeling. The sides fold down and buckets filled with corn, cucumbers, peppers, onions, potatoes, melons and cabbage spill onto the sidewalk. 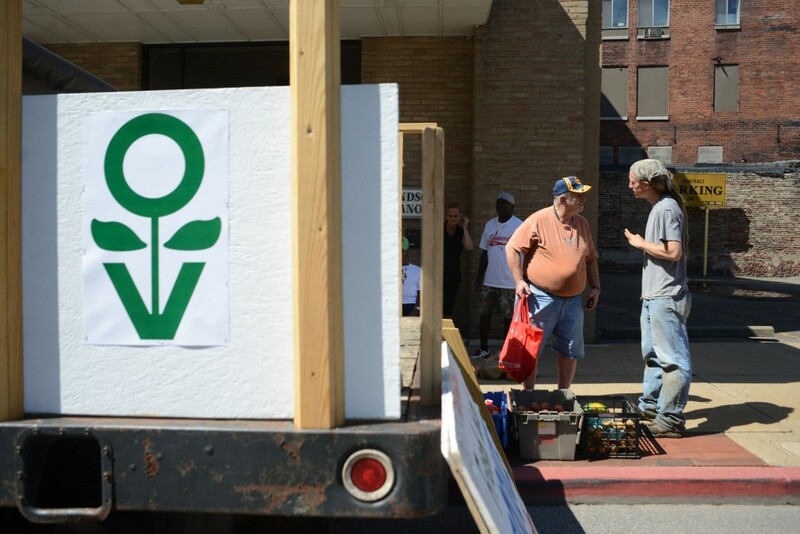 The set-up is one of Grow Ohio Valley’s outreach efforts — another chance to bring fresh produce to more neighborhoods downtown. But some seniors who live in buildings like Montani Towers are still trying to figure out this “group of hippies.” One woman saw the words “Fair Trade” on a poster advertising some of the imported items sold at Grow Ohio Valley’s mobile market and tried to barter her folding chairs for sweet corn. So Swan and his colleagues have been going door-to-door to explain that none of this is radical. 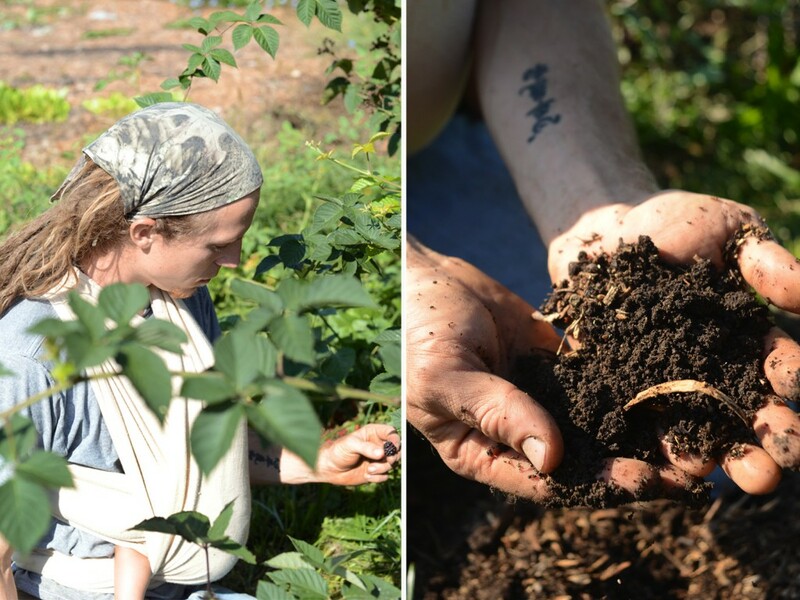 It’s the same kind of farming that older Ohio Valley residents remember from their youth. And if some of that agriculture returns, it could bring some of Wheeling’s spark back. Already, there’s more fresh food and young people in the area. If the teaching farm takes off, there will be more growth. More business. More life. Bill Hogan, 85, believed the sales pitch so much that he convinced the board of the local Schenk Foundation to underwrite Grow Ohio Valley’s start-up costs. He says it’s the first time in decades that he’s felt excited about the prospects for his hometown. “It’s just refreshing. It’s a whole new culture — a whole new attitude. You’ve got people eating healthy food. There’s young people coming back into the area now — two of them my own grandnieces. It’s like a renaissance. A rebirth,” he said. But not everyone’s quite so optimistic. When the mobile market pulled up to his Windsor Manor apartment building on Main Street one recent Thursday, Marshall Cumberlidge went straight for the watermelon. “It’s nice to have here, I’ll tell you that,” he said. But does he think that Grow Ohio Valley will save his hometown? Not a chance, he said. A few decades ago, Cumberlidge was a taxi driver in Wheeling. He likes to remember Friday and Saturday nights in this town — all the lights and people and traffic. “The streets were so crowded you couldn’t even walk up and down,” he said. “Now look what you have,” he said, motioning toward an entire city block of stores that had recently been bulldozed. “Nothing” may be an exaggeration. At the very least, there are several dozen 3- and 4-year-olds at the Northern Panhandle Head Start just down the road. 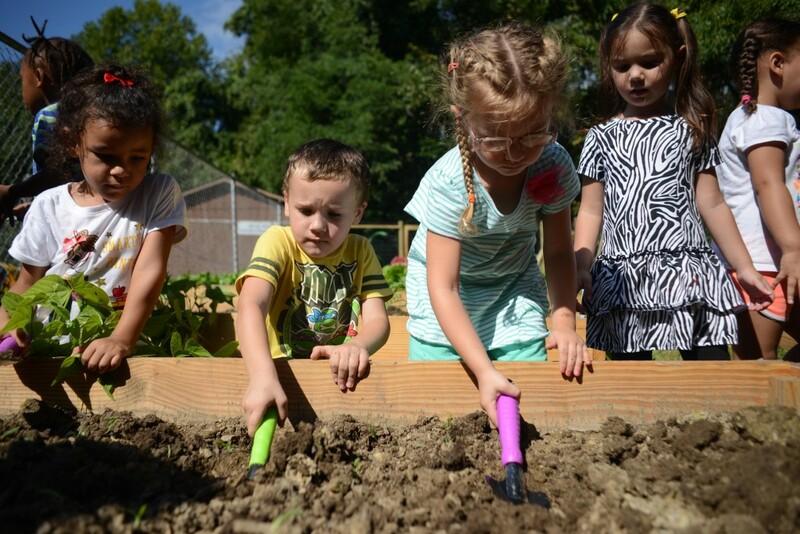 And one recent fall morning, they were learning about seeds, vegetables and new life. 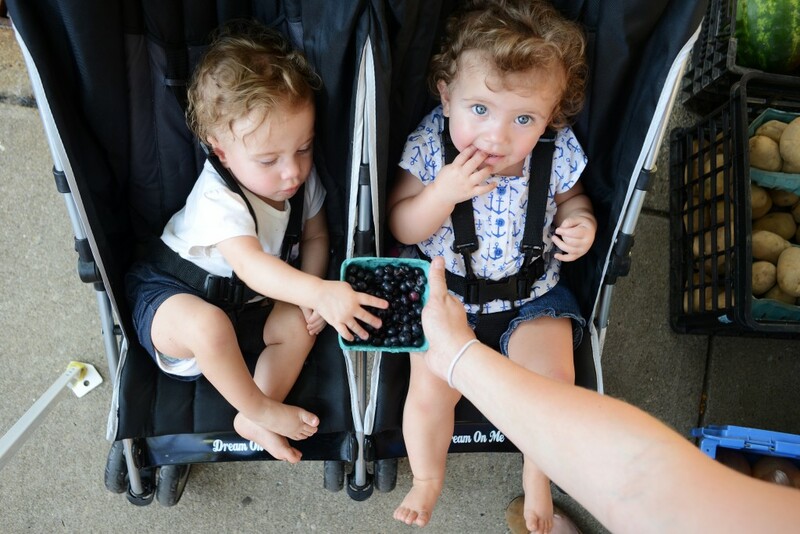 “Good morning, friends,” Kate Marshall said, as the kids tried grabbing for the garden tools. Marshall intervened. “This is a shovel,” she said. “Do we point it up? Down? Use it to sword fight?” The children were stumped. Maybe all three? Thirteen raised vegetables beds now sit at the edge of the Head Start playground. Marshall and the Grow Ohio Valley team helped a group of teachers and parents build the wooden frames and shovel eight wheelbarrow loads of dirt into each. 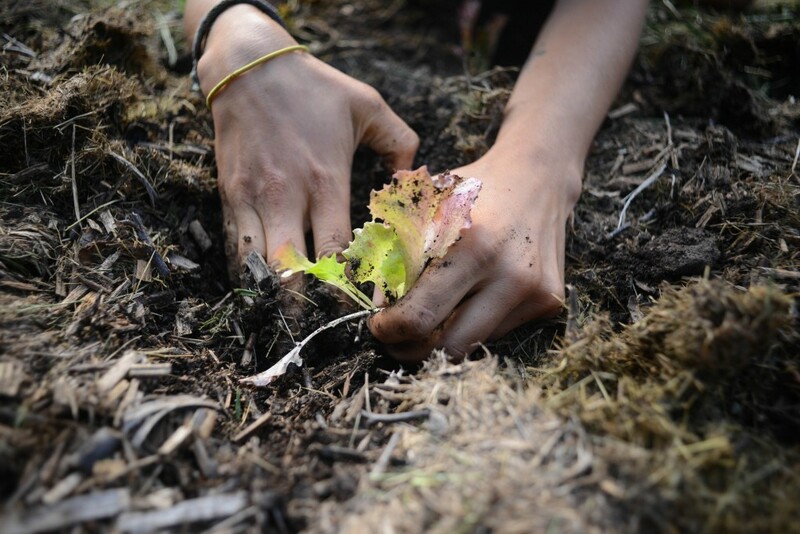 The children planted the seeds — most inside the garden beds, some not. Marshall will continue coming here on a weekly basis to provide guidance for making the garden grow. “Who knows about sweet corn?” she asked the kids, pointing toward the bed where the corn stalks will eventually sprout. “I know one thing. It’s hard to eat without your front teeth,” one girl shouted. 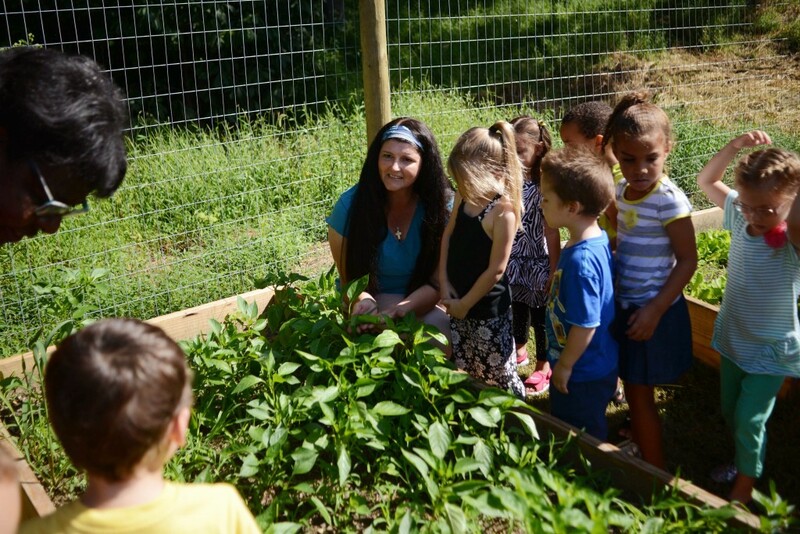 This is just one of about 22 new community gardens Grow Ohio Valley has helped foster at schools, apartments buildings and nonprofits throughout the city. 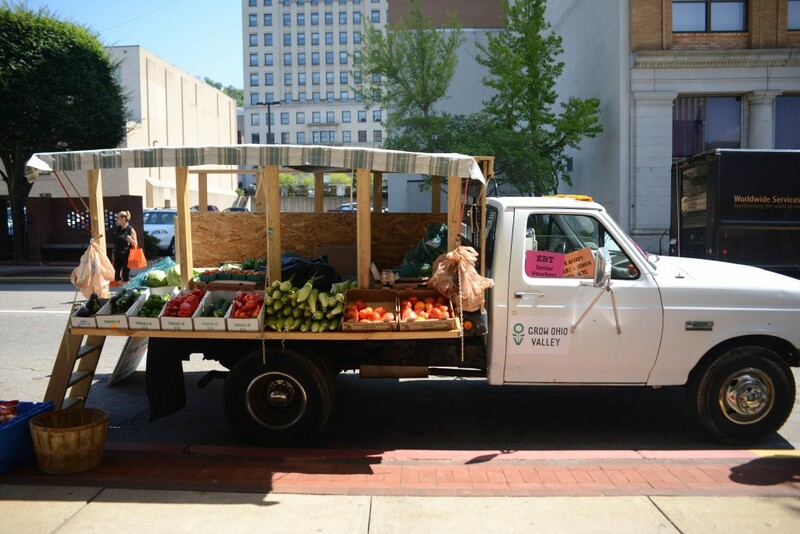 One on Wheeling Island supplies fresh produce directly to the shelves of a local food pantry. Others have become community gathering spots. The main objective is to get this area’s residents excited to be producing something again. And the younger they start believing that’s possible, the better, Marshall said. Ken Peralta’s friends from New York sometimes ask him why he now lives in a city like Wheeling. He can tick off the joys easily enough: Rolling hillsides. A great park system. A symphony. But there’s also the negativity, he said, the crumbling and forgotten historic architecture, the people walking to the convenience store in pajamas and slippers at 2 in the afternoon to buy a 36-pack. But here’s the thing: Wheeling, like Oz, has a knack for surprises — for new growth in the most unexpected places. Under a bridge. At the top of a dead-end staircase. And from the soil that contains the rubble of everything that came before.